In back-end LED sorting process, as the blue tape that is stuck beneath the LED chip is peeled off, because the bottom pin needs to be re-positioned to the film on top to allow the LED chip that is to be sucked away to be removed by the upper suction pod. During high-speed movement, the impact strength of the upper pin may be too strong, causing the LED chip to crack. In addition, to shorten the motion cycle period, the swing arm must conduct short,high-speed movements, which involve rapid acceleration/deceleration. To ensure that the mechanism can endure these vibrations, most machines decrease the speed and consequently decrease throughput.The term Backend refers to dicing the wafer into individual chips and all the processes thereafter; such as test, assembly and packaging. The goal of inline packaging inspection equipment is to provide high precision 100% analysis while maintaining high throughput. In this high speed pick & place application, to ensure that rapid pick and place processes did not cause the eject needle to damage the LED dies, PCI-1203 provided a "Torque Limit Table" function. The "Torque Limit Table" was set up preemptively, giving a location list in which the maximum torque parameter of the motor at every location was designated; maximum torque value was sent to the servo drive at every DDA cycle. PCI-1203 also provides a "PT/PVT" function to smooth the continuous trajectory and acceleration. 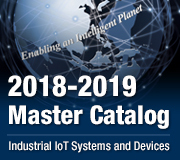 When equipment builders are designing advanced precision machining machines, choosing the right components determines how successful it can be.The PCI-1203 is a 2-port EtherCAT PCI Universal card. 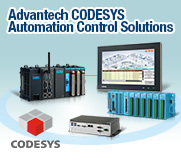 It is a ready-to-use EtherCAT development platform for all PC-based industrial automation. The EtherCAT protocol stack is executed autonomously on the PCI card. It allows the host to handle up to two EtherCAT networks with extremely short cycle time for Motion and pure I/O applications. 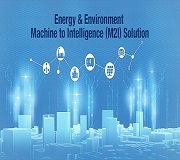 For EtherCAT motion port, communication cycle time is no more than 500μs for connecting 32 axes of servo motors and for fast I/O ports the cycle time is no more than 200μs in a high speed I/O system. Real-time and high-precision capability are features of PCI-1203. 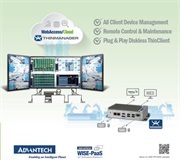 In addition, all Advantech motion controllers use the "Common Motion API" architecture which is a unified user programming interface and graphical utility. 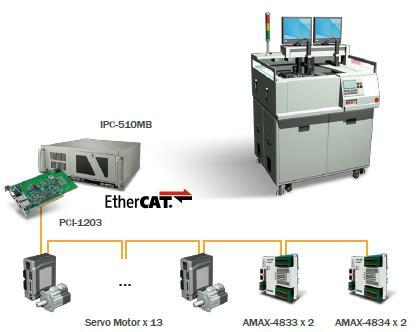 The AMAX-4833/34 is an 32DI/32DO industrial EtherCAT slave module equipped with the EtherCAT protocol. Its compact size and DIN-rail mount kit can install easily in a cabinet. Euro type pluggable terminal blocks and LED indicator help users to maintain and set up their system. All digital input channels are protected by 2,500 V DC isolation. In this case, the "Torque Limit Table" functions enabled the equipment motion cycle to be greatly shortened (Period = 0.15 sec/chip; UPH = 24,000ea/hr); the "PT/PVT" function fulfilled the user-defined S-curve according to the machine's characteristics, and vibration suppression was also achieved. In addition, the PCI-1203 also supports 13-axis synchronized control. 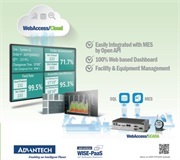 All machine behavior can be efficiently developed using Advantech's powerful and flexible SoftMotion API.